Nearly half of the United States’ airborne fire suppression equipment was operating over Colorado on June 25, 2012, CNN reported, as tens of thousands of acres burned. 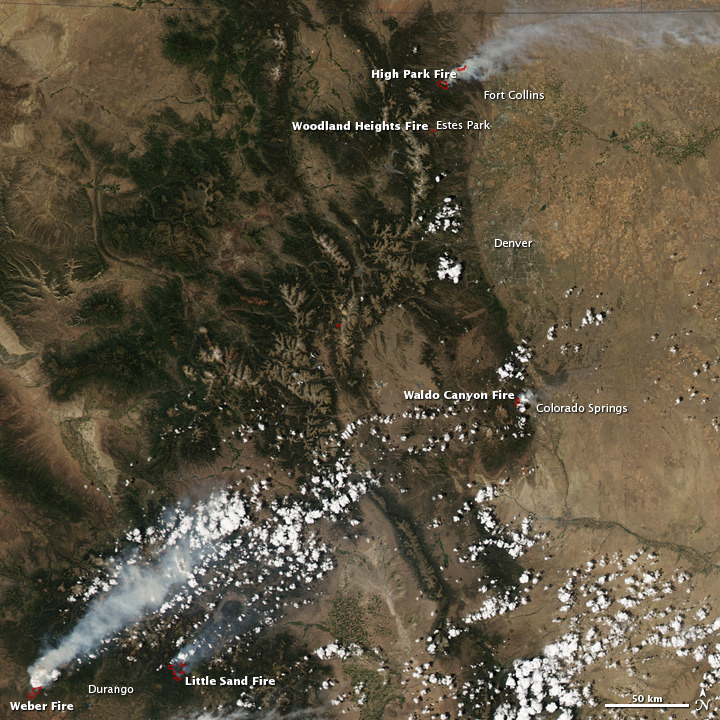 Fires raged in southwestern Colorado, northeastern Colorado, and multiple locations in between. 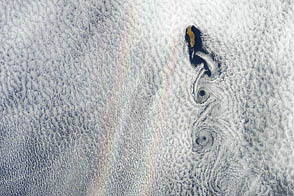 The Moderate Resolution Imaging Spectroradiometer (MODIS) on NASA’s Aqua satellite captured this natural-color image on June 23, 2012. Red outlines approximate the locations of actively burning fires. The High Park and Weber Fires produced the largest plumes of smoke. 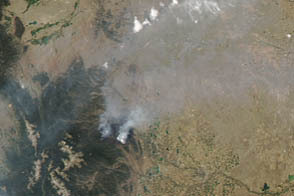 The High Park Fire continued to burn west of Fort Collins. Started by lightning on June 9, 2012, this blaze had consumed 83,205 acres (33,672 hectares), making it the second-largest fire in Colorado history, after the Hayman Fire that burned in 2002. As of June 25, more than 2,000 people were fighting the High Park Fire, and firefighters had it 45 percent contained, according to InciWeb. Nevertheless, The Denver Post reported that the fire had destroyed 248 homes, making it the most destructive in Colorado history, even if it was not the largest. In the opposite corner of the state, the Weber Fire started around 4:15 p.m. on June 22. As of June 25, the fire had burned approximately 8,300 acres (3,400 hectares) and was being fought by 164 personnel. The cause was under investigation. The fire had high growth potential because of possible wind gusts from thunderstorms, InciWeb reported. On the other side of Durango, the Little Sand Fire had been burning for weeks after being started by a lightning strike on May 13. As of June 25, that fire had burned 21,616 acres (8,748 hectares), was being fought by nearly 200 people, and was 31 percent contained. 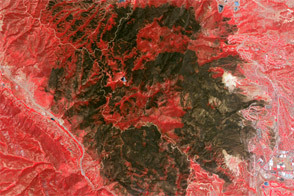 West of Colorado Springs, the Waldo Canyon Fire forced 11,000 people from their homes, many of them compelled to evacuate in the middle of the night on June 23–24. The fire started around noon on June 23, and by June 25 it had grown to 3,446 acres (1,395 hectares). InciWeb stated that 450 firefighters were battling the blaze, which retained the potential for rapid growth. The Woodland Heights Fire just west of Estes Park was small but very destructive, consuming 27 acres (11 hectares) and destroying 22 homes, Denver’s Channel 7 News reported. That fire was completely contained by the evening of June 24. As fires burned, Colorado also coped with extreme heat. The Denver Post reported that Denver endured triple-digit temperatures June 22 through 24, and the National Weather Service forecast temperatures of at least 100 degrees Fahrenheit (38 degrees Celsius) for June 25 and 26, with temperatures in the upper 90s through June 29. 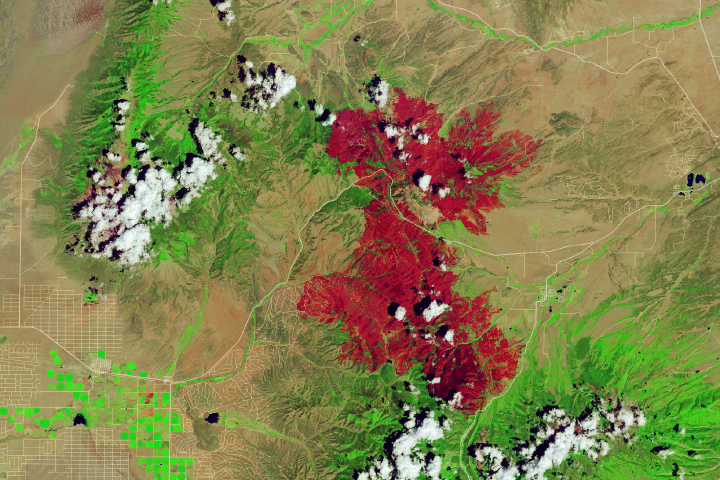 Colorado’s fires have followed a dry spring. Although the state experienced unusually heavy snow in February, little snow followed in March and April, part of a larger pattern of low snowfall. By June 19, 2012, conditions throughout the state ranged from unusually dry to extreme drought, according to the U.S. Drought Monitor. 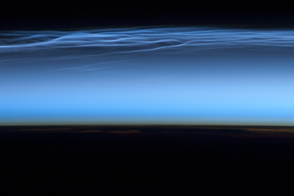 NASA Earth Observatory image by Jesse Allen using data obtained from the Land Atmosphere Near real-time Capability for EOS (LANCE). Caption by Michon Scott. 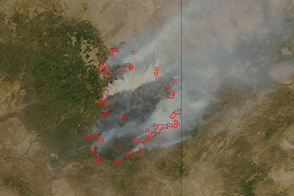 Acquired June 23, 2012, this image shows wildfires burning across Colorado, including the second-largest fire in Colorado history. 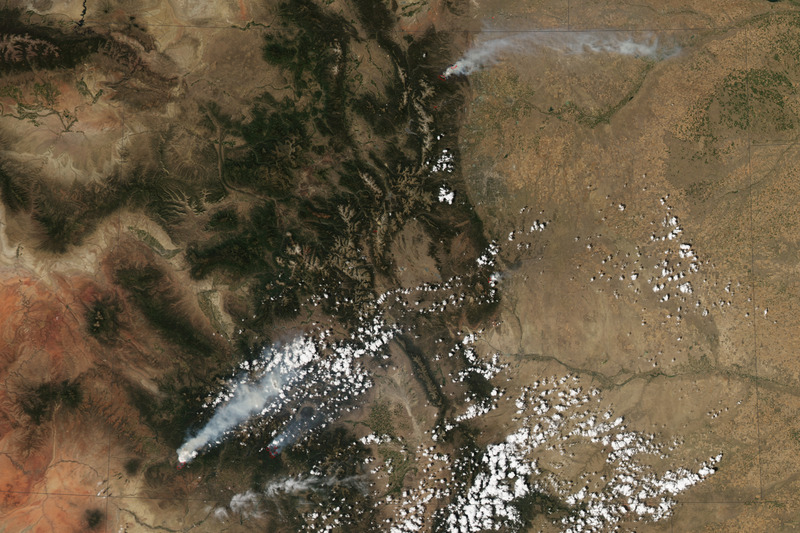 In late June 2012, wildfires burned from southwestern Colorado to northeastern Colorado. Bunch, J. (2012, June 8) Colorado’s Hayman fire set high marks for size, cost, heat and rehabilitation. The Denver Post. Accessed June 25, 2012. 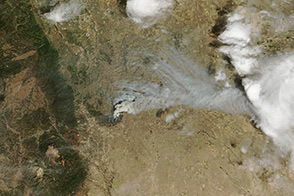 Gray, M. (2012, June 25) Wildfires burn across Colorado, Utah; force more than 10,000 from homes. CNN. Accessed June 25, 2012. Hanlon, T. (2012, June 24) At least 248 homes destroyed in High Park fire. The Denver Post. Accessed June 25, 2012. Harrison, W., Gathright, A. (2012, June 24) 22 homes lost in Estes Park fire; 100 percent contained. Channel 7 News. Accessed June 25, 2012. InciWeb. (2012, June 25) High Park Fire. Accessed June 25, 2012, 11:30 a.m. MDT. InciWeb. (2012, June 25) Little Sand Fire. Accessed June 25, 2012, 11:30 a.m. MDT. InciWeb. (2012, June 25) Waldo Canyon Fire. 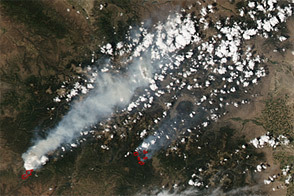 Accessed June 25, 2012, 11:30 a.m. MDT. InciWeb. 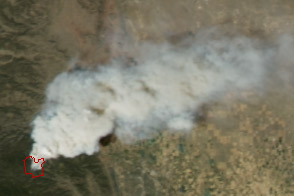 (2012, June 25) Weber Fire. 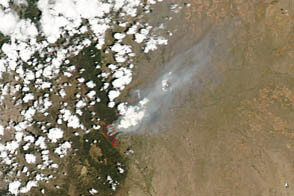 Accessed June 25, 2012, 11:30 a.m. MDT. Lee, K. (2012, June 25) Waldo Canyon fire forces 11,000 people from their homes. The Denver Post. Accessed June 25, 2012. McGhee, T. (2012, June 24) Denver baking while fire rages throughout Colorado. The Denver Post. Accessed June 25, 2012. National Weather Service. (2012, June 25) Denver Forecast. Accessed June 25, 2012. University of Nebraska-Lincoln. (2012, June 19) U.S. Drought Monitor. Accessed June 25, 2012.